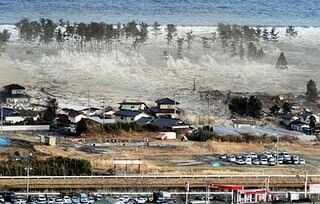 That was when i was tweeting and saw on my timeline there was a news about "an EARTHQUAKE in Japan" i was so surprised ! oh, GOD ! what the hell ?! first, my friend's tweet said "an earthquake in Japan 8.9 SR, there might be a tsunami, be careful for people in east Japan" and just a minute later, he posted new tweet about Japan "earthquake in Japan and tsunami as high as 6 meters" i was surprised again ! i left my laptop and turn on my television, i saw the news in metro TV. oh, NO ! i was really sad, all of people in twitter posted tweet about #prayforjapan and i did the same. i send to all my friend a short message about the earthquake, then they said "WHAAT ?! where do you know that ?" and i replied "from my twitter and television" they down some mourning after knowing it. 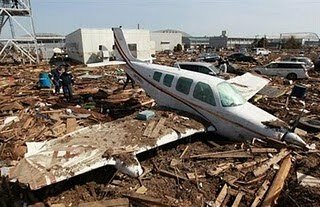 i followed the news and saw Japan in destroyed now. i remember the earthquake in Aceh six years ago. that was in 26 December 2004 when i had breakfast with my big family. we felt dizzy and knew that was an earthquake. many people die at that time. same like Japan now. the creator of pokemon was die and Masashi Kishimoto the creator of Naruto reportedly lost because of that disaster. and this morning i just knew that was a nuclear disaster in Japan now. and at the school my friend ask me about that. "do you think Japan can move on for this deterioration ?" i replied "of course they can. I believe Japan can move on"
"why you can think like that ?" she asked again. "america dropped the nuclear bomb in Horishima and Nagasaki, Japan in the deterioration at that time, but you can see, like what now Japan. Japan look fine like nothing happen in 65 years ago. so, i believe, Japan can move on and recover like yesterday" i explained. maybe, i'm too late posting this news. Because i'm busy, i had examination now. HAHA :D that's terrible right ? 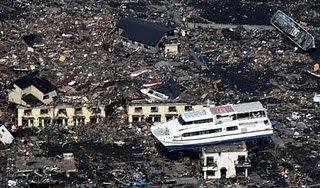 hm, I just can pray for Japan, hope Japan can recover like yesterday ! AMIN. wish me luck too :) wish me can pass the final examination and can continue my study in the best senior high school ! AMIIIN !